The horror stories of the athletes that earn and lose $10’s or $100’s of millions are aplenty and new stories are being reported all the time. The causes for these sad tales are varied and may or may not include the awful element of an unethical or fraudulent advisor. While every situation is different, there are factors and considerations that transcend all and they need to be addressed throughout an athlete’s career in order to prevent financial disasters and build financial foundations that will support them throughout and beyond their competing days. In the following paper, we define these common factors for all professional athletes and we offer a practical roadmap that if followed, will help eliminate financial distractions. Each of the strategies in the roadmap are relatable for athletes as they deploy the same thought processes used in competitive sports and apply them to financial decisions. Financial wellness is a critical component of overall wellness. If an athlete is financially unwell, it will negatively impact all other areas of life and reverse progress of mental and physical training. There is no universal optimized budgeting and investment program to account for these differences for pro athletes as a group. These data points are major factors that will impact risk profiles and investing time horizons and they must be considered by the athlete investor and his/her financial advisor prior to making any investment decisions. This finding is counter-intuitive to all principles of budgeting and saving. It is also counter to the economic life cycle hypothesis which predicts that people smooth consumption over time by saving when income is high so they can provide when income is low. While the data sources for the finding are from NFL players only, we know from all of the pro-athlete financial horror stories, this happens in other sports as well. Another significant finding from the research is active players don’t file bankruptcy. However, after two years post-retirement bankruptcy rates spike. The preparation for post-playing career needs to start before an athlete’s rookie season. While there has been no research study that has identified exact behavioral patterns and personality traits present in every elite athlete, there is enough data that point to high incidence of certain behaviors that they should be considered when making financial decisions. Well before any dollar amounts are discussed, athletes and their advisors need to discuss behavioral patterns that have driven their success in their sport and how the patterns may influence thought process in financial decision-making. Several studies show elite athletes have high levels of Confidence, strong Internal Drive/Achievement Motivation, Freedom from Worry and more Comfort with Risk. Athlete investors’ behaviors that drive their success in sport could be detrimental to achieving and maintaining financial wellness. For example, some behavioral scientists categorize people according to the Self Regulation Theory which describes people as either prevention-focused (do not want to fail, don’t necessarily play to win, more often play to not lose) or promotion-focused (play to win, higher likelihood they’ll take chances and grab opportunities). A figure skater who will lose points for mistakes may perform with a more prevention-focused mindset than a soccer player who needs to score points to win and therefore might play with a more promotion-focused mindset. Numerous studies have shown that human brains don’t have a fully developed pre-frontal cortex until age 25. This is extremely important as it relates to financial decisions being made by athletes under the age of 25 AND this makes it imperative that athletes start learning to weigh risk/reward outcomes well before age 25. Even the most well-educated professional athletes under the age of 25 don’t physically have full brain capabilities that are required for prudent financial decision-making. They need financial advisors who are coaching them on the fundamental processes of risk/reward analysis, asset allocation, assessing financial goals, etc. Risk/reward assessment is constant In athletes’ lives in their sport but they typically don’t think of it in these terms. Their success depends on their abilities to read opponents (teams, individuals, innate objects), make immediate decisions and execute past their opponents to achieve their goal. This constant assessment process is used to make split-second decisions. The critical discussion and assessment of an athlete investor’s risk tolerance and risk profile should be the same thought process they employ when competing, just using different end goals and factors. Relating the fundamental analysis necessary for prudent investing to an athlete’s natural thought process joins athlete and advisor at the same starting point. It allows the athlete to begin to trust his/her own knowledge at the start of a financial decision-making process rather than presenting an overwhelming new concept that takes time to learn and conquer. After establishing this common starting point, the framework of a budgeting and investment plan can begin. Athletes should learn that while competing, they’re risking the most important thing in their lives; their bodies. They’re putting their bodies through rigorous and repeated conditioning exercises to prepare for winning. This factor should be the foundation for the financial decision-making process. Compensation from this ultimate risk should be protected, sustained and managed with great vigilance and discipline. Athletes need an advisor who coaches them to separate the risk/reward analysis they perform everyday in their sport from the risk/reward analysis they apply to their investment decisions. While it is the same thought process, the factors and goals for outcomes are radically different. The line in the graph below represents a series of optimized portfolios. 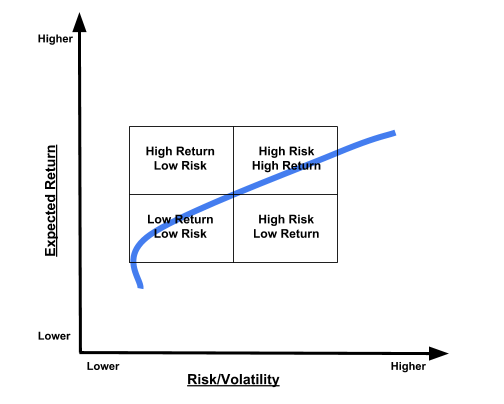 Using historical market return and risk data, each point along the line reflects the intersection of expected return for each level of risk an investor is taking. Investment decision-making discussions should start on a point on that line that represents an individual’s risk tolerance. 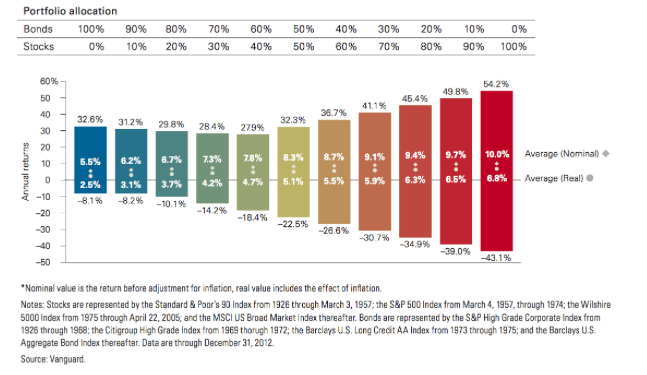 While it’s tempting to find a portfolio that will defy historical returns over time and achieve a point of the graph in the top left quadrant, such a portfolio doesn’t exist. Just as the calculations are based on many years of historical data, an investor’s time horizon for funds in these portfolios must be long-term. It’s a very different risk/reward proposition than what is used during competition. Outcomes for long-term investments take years to be determined vs. outcomes in sports which take seconds (or less than seconds), minutes or hours. This personal financial game plan is critical to achieve investment goals. It needs to be adjusted on a regular basis in order to be effective and ultimately drive long-term performance. Only after careful consideration of behavioral tendencies, risk profile and short and long-term goals can the advisor and athlete investor begin to apply those findings to the search for an optimal portfolio. Without a functioning asset allocation, the athlete investor can be tempted to deploy some of those behavioral characteristics (comfort with risk, confidence, impulsivity) that are helpful in their sport but not best used for investment decisions. This does not mean that an athlete investor should never decide to allocate money to a high-risk investment. However funds for those investments need to be set aside, away from the majority of their assets which are invested in their closely monitored portfolio. That high-risk money should be less than 5% of their overall portfolio and an amount that the athlete investor is comfortable losing. Additionally, a high risk investment should be carefully vetted with experienced professionals. Most areas of life are a continuous cycle of making plans (Strategizing), adjusting and reworking plans (Innovating) and carrying out plans (Executing). Athletes are constantly making game plans, quickly adjusting during competition and executing each iteration. Living a financially healthy life in order to minimize financial distractions requires the exact same cycle. Whether determining a budget or an investment plan and asset allocation, the Strategize. Innovate. Execute. process is the same. Too often financial professionals aren’t able to relate financial fundamentals to athlete investors and the process becomes an overwhelming new challenge to learn and overcome. Financial wellness is important in everyone’s life but especially an athlete’s life. The athlete’s training is a continual physically and mentally grueling process that fuels peak performance during competition. Distractions from this training can slow progress and negatively impact performance levels. Financial distractions can be devastating to training and competition as they’re usually not quickly resolved. They are usually issues that need a lot of time and energy over the course of several days, months or years. Professional athletes regardless of their sport, face strikingly different circumstances for achieving financial wellness. Because of the radically different career statistics, of which age and earnings rate are major factors, the path to healthy financial decisions must include radically different considerations than those of non-athlete investors. It is imperative that advisors to professional athletes join their clients where they are on their financial journey and understand their individual intersection of behavioral tendencies and financial knowledge. Professional athletes are unique investors but with the appropriate advisors, they can achieve financial wellness, protect their earnings and financially support themselves and their families well beyond their professional competitive careers.